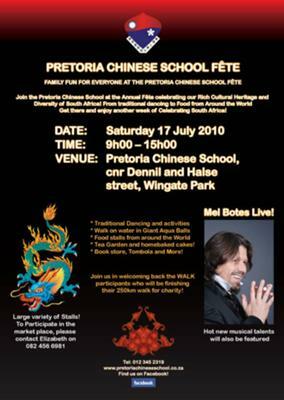 Pretoria Chinese School Fete featuring Mel Botes LIVE! FAMILY FUN FOR EVERYONE AT THE PRETORIA CHINESE SCHOOL FETE! Join the Pretoria Chinese School at their Annual Fete and Celebrate their rich Cultural heritage! From traditional dancing to Food from Around the World – join them in Celebrating South African Diversity! Don’t miss Mel Botes performing Live as well as a host of other musical talents and entertainment! •	Tea Garden with homebaked cakes! •	Book store, Tombola and More! Shop at a large variety of Stalls while your kids enjoy paintball, face-painting and more!